Okay, I did squeeze in a smidgen of work today, but mostly I took the day off. Finally the east gets its own "we make our own ice cream" joint: Ice Cream Chefs, along East Coast Road at Ocean Park. 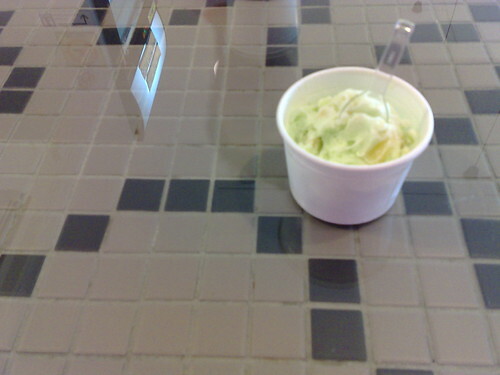 Unpretentious is the word --- there are only about 10 ice cream flavours and seating at about 5 tables. Still, that's good enough of a range. I had a Mrs Smith --- green apple with cinammon, very fresh and sorbet-tasting, just what the doctor ordered on a hot, humid afternoon like today's. The friend I was with had a Cuppucino that had real coffee kick (as opposed to the overly sweet taste of most coffee-flavoured desserts). I want to come back for the Nutella Delight (tempted, Dave?) and maybe even the Horlicks for nostalgia's sake. Ice Cream Chefs' niche --- because whipping up one's own flavours isn't enough these days --- seems to be also that they "mix in", not just sprinkle on top, whatever sweet additions one might desire, from chocolate syrup to Tim Tams to granola. The mixing-in process necessitates a measure of folding the additional ingredients into the ice cream and sort of mashing everything together, while the ice cream retains a fairly solid consistency. For people who have a really sweet tooth, I guess.